This is my one of my favorite and most beautiful DIY ideas so far. 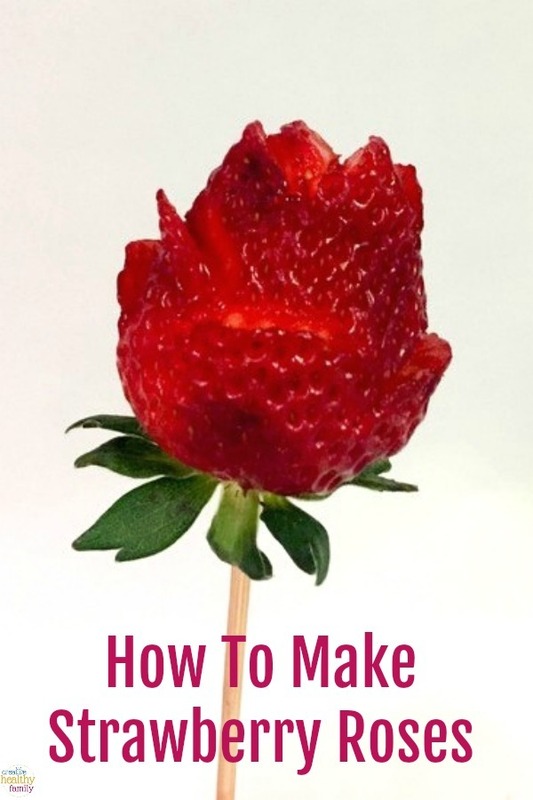 Let me show you can easily make your own strawberry roses at home. I think they are just perfect for any table decoration, and the best part is you can eat them too! Have you ever noticed how roses and candy seem to be the go-to gift for just about any holiday celebrated by moms? Valentine’s Day, Mother’s Day, birthdays- you name it. If mom celebrates it and we can’t think of something else to buy her, we grab a box of chocolates and a dozen roses. While it’s a nice gift (it’s the thought that counts, right? ), roses fade fast and candy doesn’t really scream “healthy living.” Strawberry roses, on the other hand, give her the best of both worlds. They’re as pretty as a flower and as tasty as candy, but a whole lot healthier and more budget-friendly. Plus, moms love getting DIY gifts from the heart, no matter how old their kids may be. 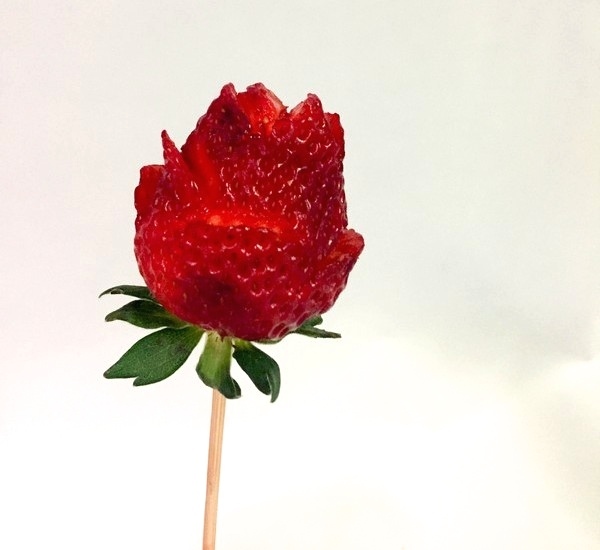 Making strawberry roses isn’t as hard as you might think! If you have a little patience and a somewhat steady hand, you can pull off a beautiful bouquet for that special someone in your life. Fresh strawberries, obviously. The bigger the better. 1. Grab a nice-looking strawberry and insert a fork or skewer into the base (the part with the leaves). 2. Hold the skewer close to the top, just beneath the berry. This gives you the most control over it as you carve. 3. Start at the bottom and make a small slice but be careful not to go all the way through. This will be your first petal. 4. Use the knife’s edge to curl the petal out and down a bit, so that it looks like an actual rose petal. 5. Repeat three more times on the base. 6. Move up just above the first row and make another slice to start your second row, making three petals on this row. 7. 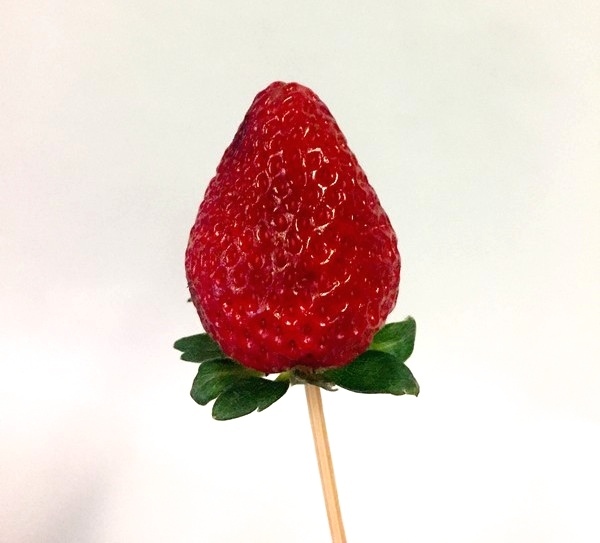 Depending on the size of your strawberry, you may have room for one more row. If not, go on to the next step. 8. Finish off the rose by gently slicing downward at the tip and curling back each side. 9. Repeat with the next strawberry! When you’re shopping for strawberries, get more than you think you’ll need in case you make a mistake. Try to find nice large berries with a fat “base” (the part right above the leaves). Frozen strawberries can work in a pinch, but make sure they’re whole and not sliced. You’ll need to thaw, wash, and dry them very well before using because the syrup makes them a bit slimy. 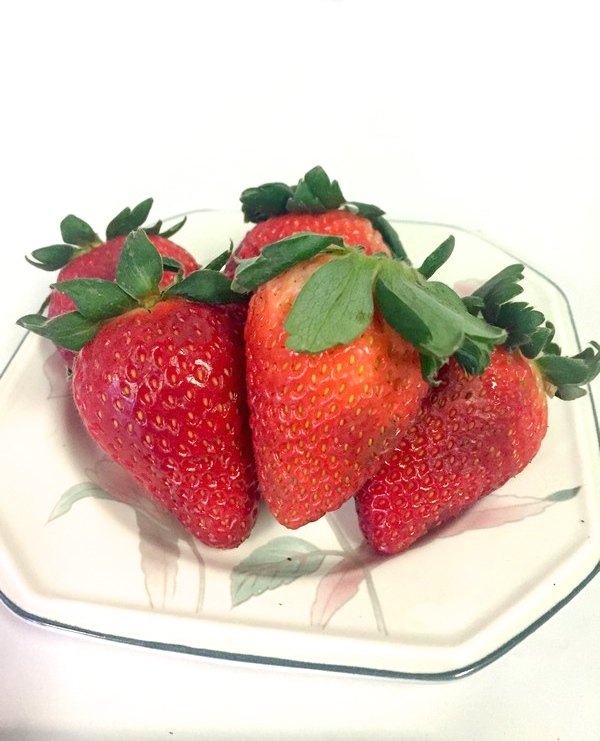 They’re not the best option by a long shot, but for those who live in areas that don’t see the really nice fresh strawberries until summer, they’re definitely better than small berries. 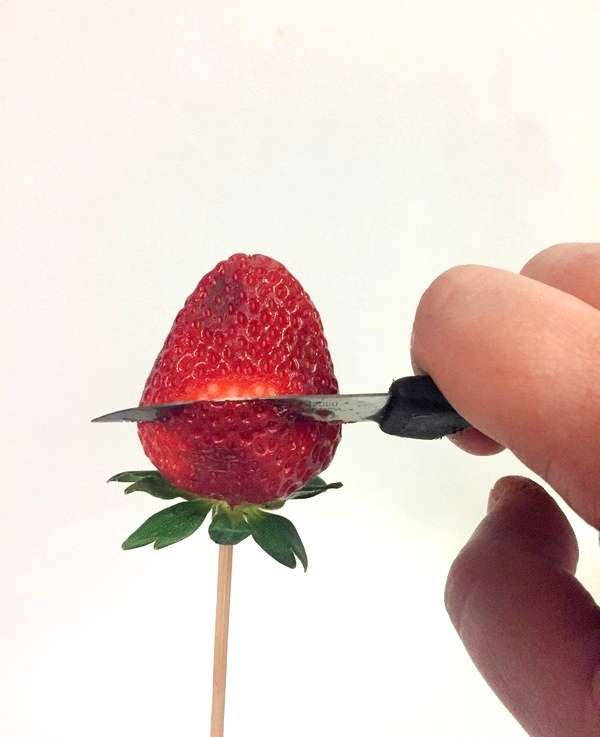 You can use either the fork or the skewer to hold your strawberries while carving. They both work equally as well. The only downside to using the fork is that you’ll have to transfer it to the skewer when you’re done. 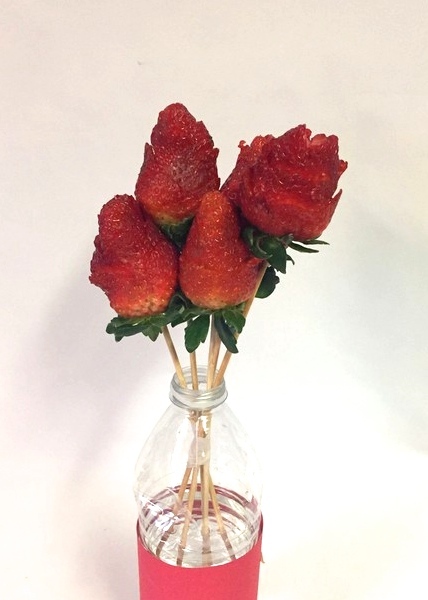 Once you finish making a strawberry rose, place it upright in a strong glass or tall mug. You don’t want to lay it down flat because the “petals” will get squished. After you finish making your strawberry roses, tie the skewers together with pretty ribbon and place them in a tall, thin vase. Don’t have a small enough vase? No problem! Take an empty water bottle and fill it about ¾ of the way with water, so that it doesn’t tip over when you put your “roses” in it. Then use ribbon, red scrap paper, or colorful duct tape to make it look gift-worthy. Another great idea: have your kids decorate the vase while you carve the roses. It’s a fun way to get the kids involved if you’re making this as a gift for their grandparents. Although red “roses” are classy and gorgeous on their own, sometimes you might want to add a bit more contrast to the arrangement. Try making some cherry tomato tulips to go along with them. They’re just as easy as the roses (maybe even easier), and the cream cheese filling helps add a little white to break up all the red. If you’re not a fan of tomatoes, try some of these other fruit flower ideas. One last tip: if you make a mistake with a petal, don’t toss the whole berry. Even flowers in nature have flaws, and they’re still beautiful. Just put the side with the mistake on the “inside” of the bouquet.